Zizek: Why we (I) love him? Had a semi-reunion with EJ, Josh & Joy and of course, my Bkt Mertajam kaki Y and my wife JR at Starbucks last night. The topic of the conversation inevitably move from craps to theology to philosophy to politics – and not necessarily in that order. 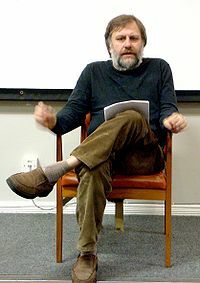 EJ asked us; why do we like Slavoj Zizek? He asked Josh and he asked me. I said there are two things; one, Zizek infused new energy into philosophy. I really don’t think Zizek or for that matter, any recent philosophers have said anything new, except to temporal-culturally contextualize age old, well debated philosophical ideas. But in a field often characterize by boring and winding discussions and tomes of thick books by dead authors, Zizek’s raw and rugged passion is a fresh welcome. To me, I do not agree with an elitists’ monopoly of philosophy, be it the academic philosopher or the “philosopher-king”. The democratization of philosophy, however, is only a vehicle towards two ends, firstly, to provide the tool of social criticism to the masses (including of course, understanding “biases”) and secondly, to provide the tool of social construction to the self-same masses, because if the people is to be “king”, philosophy helps them to be better ruler through a properly constructed ideas and worldviews. In that sense, Zizek speaks to a whole new generation of people with a lot of energy, a lot of information a lot of opportunities, but have nowhere to go, because of the abandonment of classical philosophy (taken over by, among others, postmodernism) and the classical way of learning/doing philosophy (which includes, among others, postmodernism). Zizek’s vulgarity identifies itself with the activist-boldness of our generation. Zizek’s critic of the current social constructs (including present day capitalism) is better received and easier to digest by the modern mind than the unfamiliar philosophical criticism of Socrates, Kant, Hegel or even Marx of their times. The second reason I think why we, or at least I, like Zizek is because here is one guy who managed to bash capitalism and then make use of it to profit himself (not necessarily financially, although in his case, it probably includes financial profit). In Wittgensteinian language, he had managed to climb the ladder and discarded it! But more importantly, I think Zizek proved Marx’s point about socialism and capitalism. That the communist society must inevitably be modern and modernity can only come from capitalism (not feudalism). In this sense, socialism is not an apocalyptic wiping out of capitalism, but rather a progressive evolution upon capitalism. I do not know if Zizek really sees it this way, but at least his actions form provide the argument for us. What about you? Why do you love/hate Zizek?